Is it snowing in Malles-Burgusio ?Thank you! Malles-Burgusio in Italy (in the Trentino region) is a very small ski resort with just three ski lifts ( 2 chair lifts,1 surface lift) but it does boast a very impressive 750 metres (2460 feet) of vertical descent. Malles-Burgusio has 4 pistes. Malles-Burgusio is best suited for intermediate skiers and snowboarders but there is a also a lot of terrain for beginners and experts too. Cross country ski trails can be found Malles-Burgusio. 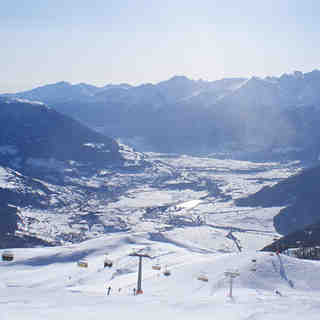 The nearest airport is at Venice and the nearest train station to Malles-Burgusio is at Merano.